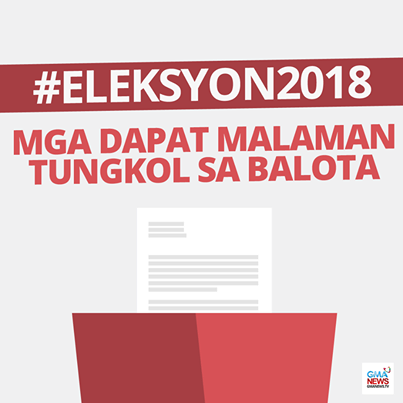 Barangay and SK Elections 2018 Voting Guidelines - Balita Boss! Checkout below the voting guidelines for the upcoming Barangay and Sangguniang Kabataan (SK) elections on Monday, May 14, 2018 shared by GMA News on Facebook. SK Ballot - The text in the ballot is printed in red, except for the instructions, which is printed in black. Barangay Ballot - The text in the ballot is printed in black. The Barangay ballots will feature Arabic translations intended for the Mindanaoan voters. The SK ballot is for voters aged 15 to 17 years old will only receive one ballot. Voters aged 18-30 years old will use two ballots, both the SK and Barangay ballots. Voters 31 years old and above will get only one ballot, the Barangay ballot. The ballots that will be used in Luzon and the Visayas are dated October 23, 2017 as these were printed for the postponed 2017 Barangay and SK elections last year, while the ballots for Mindanao will bear the correct date, May 14, 2018. The voting period will begin at 7 a.m. and end at 3 p.m. Voters are advised to cast their votes the earliest time possible.